On the 16th of February, a group of 25 students and four members of staff embarked on the schools first ski trip in a number of years. The students arrived promptly in the early afternoon and after a few emotional goodbyes from the parents and we were soon on our way to the Pyrenees mountains in Andorra. Students and staff quickly settled into their new home for the next 30 hours and prepared for the long journey ahead as we made our way to Dover. After a long 30 hour hike up the mountains, both students and staff arrived safely at the 4* Hotel Blanc Nord in Andorra. Having arrived late in the evening students quickly checked into their rooms and made their way to the evening meal. Each night students were able to help themselves to a buffet style meal which had plenty of options to suit everyone's needs and tastes. Exhausted from the journey students spent the rest of the evening in their rooms. The following day students were awakened at 08.00 to make their way down to breakfast which again was continental buffet style ranging from hot food such as bacon sandwiches to croissants; yoghurts and fruit. We then made our way to the ski hire shop to pick up our ski equipment. 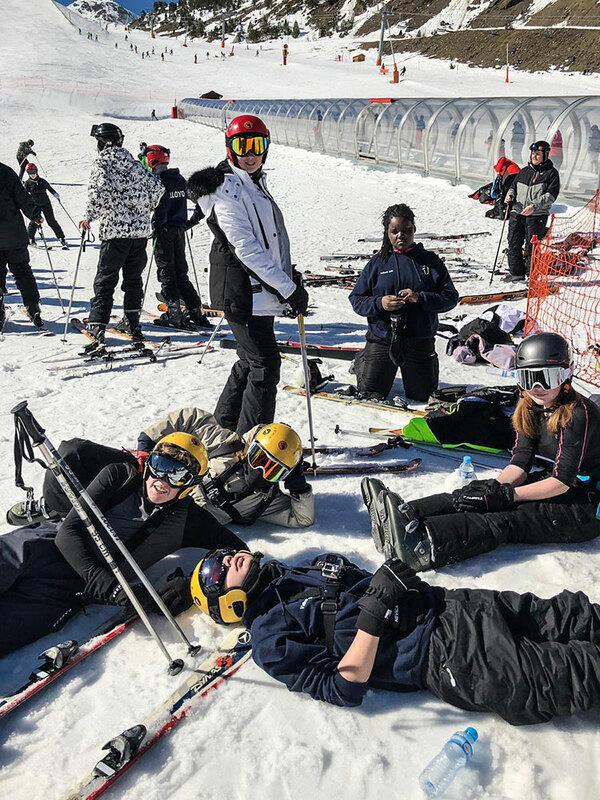 This was some students the first experience of ski equipment such as skis and boots and students quickly began to see the trouble they may face in terms of fastening the ski boots up and the effect it would have on their feet later! After picking up our ski gear we quickly made our way up the mountain to meet the students ski instructors. In order to make our evening activity students skied with their instructors for 3 hours on the first two days and four hours on the third. Students then made up for this lost time by having two five hour lessons on the last two days. This allowed students to progress from the infant slopes to the more difficult terrain and slopes with the maximum amount of time. In the beginning, students were only accessing the infant slops as they developed the technique of the snow plough and getting used to the balance and coordination required. Many students struggled in the beginning and were stating how difficult it was. It was excellent to see so many students show the determinations and resilience to keep trying time and time again no matter how many times they fell over! No student gave up and all students showed the resilience required to move onto the advanced slope. Students were able to access a buffet style lunch in the middle of their lessons to refuel ready for the afternoon session. In the evening students came straight off the slopes and were straight on the bus to the evening's activity, bowling. Students choose their own teams and battled it out to get the highest score possible. Mr Smalley had a close battle with Eevi in Y11 but was narrowly beaten in the final frame! Students were also able to play arcade games and pool after the bowling had finished. After a long tiring first day skiing, it was back to the hotel for the evening meal and bed ready for day two on the slopes! Day two arrived and students were up, fed and enthusiastically rushed into their respective ski lessons. Students were skiing for three hours in order to be in time for this evening activity. Students struggled on day two as practising a skill like skiing is incredibly difficult. It was pleasing to see so many students persevere in this difficulty and complete the sessions with confidence. Students were then taken sledging for the evening activity. All students participated and a lot of fun in the various sledges that were available including battles amongst the staff including Mr Smalley and Mr Foster. On day three students had four hours on the Pyrenees slopes with their instructors. Many students by this point were beginning to show real confidence including one group of Y11 who were already progressing onto the larger slopes on day three! Many students were commenting on how these were some of the best days of their lives. Learning to ski in the mountains with temperatures rising on day three to 26 degrees!. In the evening students were again offered a buffet style tea with a range of options and were taken to the local Andorian ice rink. Again, the vast majority of students dived straight into this despite never being ice skating before. It was another new experience for the students to try. Some excellent skaters were observed including Adam, Riley and Alex! Day four and five saw the pupil's gain five hours of ski lessons in order to make up for the previous sessions. 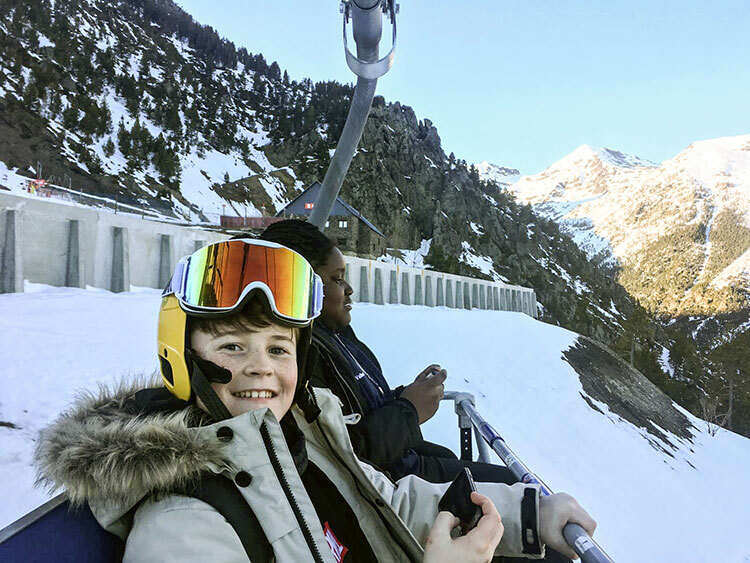 This was beneficial to the students as it meant many of them had the basic skills and were able to progress to the more difficult slopes including red and blues and were given the maximum amount of time on these slopes. It was great to see all of the students make it up to the advanced slopes by the end of the week. A true reflection of their determination, resilience and ability to never give up! The evening provided possibly the greatest challenge. Despite the use of Google maps we were unable to locate the disco venue on Thursday evening (Despite two Geography teachers being present!) eventually, the Disco was found and students were able to relax and unwind with their friends. It was also great to see so many of the students interacting and socialising with other schools! The last day marked the final five hours of ski lessons for the students. In the end, students received their certificates and posed for one last group shot on the sunrise in the Pyrenees before embarking on the dreaded 30-hour journey home. Overall, both students and staff thoroughly enjoyed Winifred Holtby's first ski trip in a number of years. Many of the returning students are already discussing next years trip. Awards were handed to the boy and girl who had impressed staff most in terms of their attitude and effort. Well done to Riley and Evie! The students were a true credit to both themselves and the academy and we as a staff were very impressed with the skills and attitude they showed in learning a difficult trip. All students commented on how much they enjoyed the trip and the skiing itself. The ski trip will run again next year and any interest must be declared to Mr Smalley ASAP.